On March 30, 2014 Dr. Cynthia Bioteau, Florida State College's president, and the FSCJ President's Cabinet unanimously approved the proposal to invite 2YC3 Southern Regional Meeting in the Fall of 2014 to Jacksonville, Florida. North Campus, one of FSCJ's four major campuses, will be the site of the conference as it is only 7 miles from the Jacksonville International Airport (JAX) and 22 hotels. We would like invite 2YC3 faculty and friends to join us the celebration of the 57th anniversary of the event that rocked the world in 1957: Sputnik (October 4th, 1957). We have selected a theme to take us from 1957 to 2057 through the eyes of the chemical world and faculty who teach chemistry. We are currently looking for colleagues who would like to contribute to our program by giving a presentation, leading a workshop, or participating in panel discussions. 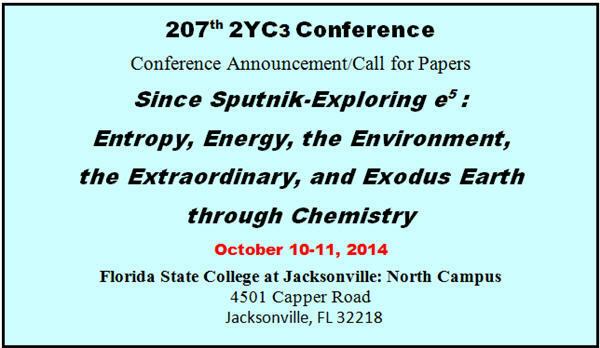 Since Sputnik Exploring e5: Entropy, Energy, the Environment, the Extraordinary, and Exodus Earth through Chemistry. hat will be teaching in 2057? ill we own the water, the food, and the energy to continue as a world power? hat role will chemistry play if we again try to leave earth for the Moon, Mars, or the Stars? If you would like to present on a different topic, please do not hesitate to submit an abstract, as we encourage as diverse a program as possible.